Fall in Denver means a few things… cooler temperatures, football and of course the first snow of the season. Just about a year ago, I went on a road trip with a friend of mine bringing me from Sacramento to Denver. While in Salt Lake City, the first snow of the season occurred there which was nice to experience. As I jumped on Amtrak to finish the trip home, the storm also headed east. By the time I got to Denver there was a foot of snow on the ground. Arriving during the snowfall I thought I had missed the opportunity to photograph, however the next morning I headed out with my camera and still found many opportunities. One of those opportunities I found while out photographing was a mix of fall and winter in parts of the city. As I walked past the State Capitol, I noticed the fresh blanket of snow and the orange leaves of fall continuing to fall upon the snow. As there was a large amount of snow during the storm, I was surprised most of the leaves did not come down with the snow. 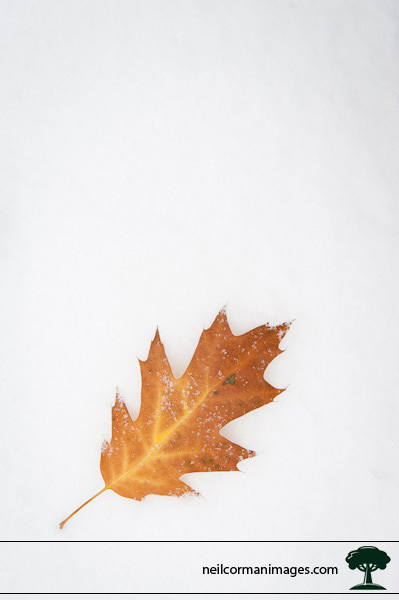 With the amount of leaves on the ground, I probably spent about an hour photographing the leaves on the snow. The image Change of Seasons is one of my favorites with the simple leaf sitting on the ground as it shows the two seasons coming together on one day.